We believe in developing freshmen and sophomores to grow as leaders, build relationships, and impact Auburn’s campus and beyond. Spring Up is a leadership program designed for freshmen and sophomores who are looking to grow as leaders at Auburn and get connected to involvement opportunities across campus. Each of the three groups meets weekly, will participate in activities, and hear from student leaders from many of Auburn’s largest campus organizations. This year, students will follow a Habitudes based curriculum. Each group will also have the chance to participate in The Big Event, AUDM, IMPACT, and other service opportunities on and around campus. Throughout the semester, members will work to discover their strengths and passions while developing their skills as leaders in the Auburn community. 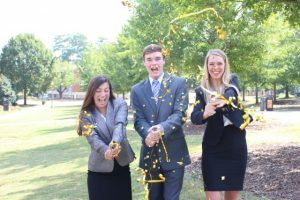 The directors will give a broad overview of many of Auburn’s large campus organizations in hopes that the Spring Up members will find their place to serve Auburn.